DIY solar panels for Part P accredited tradespeople only. DIY solar panels with self-installation kits are becoming increasingly popular with tradespeople who can bring down the cost of adoption by doing-it-themselves. MCS-approved PV solar panels are used to generate electricity from the sun. Electricians can install them, but only be commissioned by MCS-approved persons. Qualified plumbers in the United Kingdom can install this range of evacuated tube kits. These solar thermal tubes use the sun's passive energy to hot heat water tanks and swimming pools too. These MCS-approved heating panels are 'first generation' solar technology. Solar heating panels are ideal for self-installing by qualified plumbing professionals. DIY'ing cuts cost by around 60%. Part P Certification and a good head of heights are necessary. However, installs must be signed-off by an accredited MCS-installer only. Those with qualifications in plumbing and electrical trades are half way there to being able to install solar panels. Predicting the weather is an essential aspect for solar installers when working on roofs. With scaffolding and the right roofing expertise, most solar installers work in most weather conditions. I doff my cap to these hard-working individuals who are now driving the future forwards. Today, predictions of energy prices are similar to trying to predict the weather, but the future looks positive for solar technology and divestments in fossil fuels has already begun. That's why a solar panel installation is going to become an increasing necessity for most people. Like a rain jacket, you know you're not going to use it every day, but better to have than be exposed to the elements. Solar panel technology is a gift for humanity; not yet realised. When working with heights, electrics or plumbing, you should always adhere to safety regulations. Advisedly, use professional MCS installers if you're not sure. Part P' certification is essential when working with solar panels. A safe working scaffolding platform or scaffolding tower to gutter height is vital. Uses a local roofing company to handle the roofing work if unsure. How are the solar panels secured to the roof? 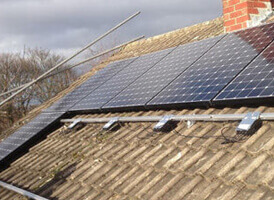 Both solar heating and PV solar panel installations are secured to the roof batons using non-degradable brackets. No degradable sealing silicone should ever be used when weather proofing pipes or wires. What's the best way to get the panels to the roof? Get a scaffolding platform up to the guttering height of the property. A winch and pulley system is available for professional installers. These can be hired by most good tool hire companies. What's the best way to connect pipes? Heating technology pressurised to a three bar flow. Because of this, professional installers always recommend compression joints for peace of mind. Solar heating technologies become pressurised to a three bar flow. Because of this, compression joints are vital. A well-insulated pipe run to and from the solar panel will ensure reduced heat loss and best performance once operational. A three-yearly inspection, checking the PH level of the antifreeze and seals and joints will provide a long life expectancy of your system. A sizing guide for solar heating panels. For every 100-150 Litres cylinder size, you'll need one flat-panel or two square meter of evacuated tubes. A sizing guide for PV solar panels. System size depends on the availability of your roof space and configuration of the collector panels. The number of collectors will dictate the size of the inverter. You can measure the roof space from within the loft space. Yes, except for Thatched roofing. If the roof space is Southerly, SW, SE direction then thats perfect. If you don't have a suitable roof space. Wall-mount or ground-mounted A-frame installations are possible too. No, except for listed building or situated in an area of outstanding natural beauty. Which type is best for DIY? PV solar panels are unsuitable for DIY installing. Solar heating systems can be installed with good plumbing knowledge. These DIY solar panels kits supply you with MCS approved and BRE accredited technologies. What accreditations do I need for solar heating? Plumbers and self-installers have the necessary Part P' qualifications to install a solar heating panel system. The only aspect where you'll need help is the roof fixtures. Alternatively, many plumbers have teamed-up with local roofing companies to complete the job together. Flat-plate or evacuated tube collectors installers must observe the usual professional safety procedures. What accreditations are required to install PV? Apart from a good head of heights, the installation requires Part P' qualifications for basic setup and MCS-accreditation to commission the completed system. Which is system easier to install, PV or heating? Generally speaking, they both have advantages and disadvantages. You'll require MCS accreditation if you are planning on selling surplus electricity to the the National Grid though. Will I need a new hot water cylinder? If the heating tank in question doesn't have a twin-coil system, then yes! Look for two unused ports at the bottom of the tank to check. The secondary coil is used to transfer the solar heated glycol fluid from the heating panels to the hot water tank. DIY solar heating kits come supplied with or without 150, 180, 200, 250 and 300 Litres cylinders, vented or un-vented. Do you supply fitting instructions with your kits? Yes, step by step instructions can be found with DIY solar installation guide.